Despite the fact that Google Now integration in the Google Search app is amazing, it can never truly replace Siri. Even if you do make Google Now initiative with a long press of the home button on your Jailbroken device, Google Now cannot do system functions like set reminders through the stock reminders app. This is all about to change though thanks to the Googiri Cydia tweak. The Googiri Cydia tweak allows you to use Google’s Search app as your personal assistant and extends its functionality to work with Siri. For example, if you said “What’s the weather like outside” through Google Now you would get your stereotypical Google Now result. If you said “Hey Siri, What’s the weather like outside” though, then Siri would initiate rather than Google Now and take over the query. 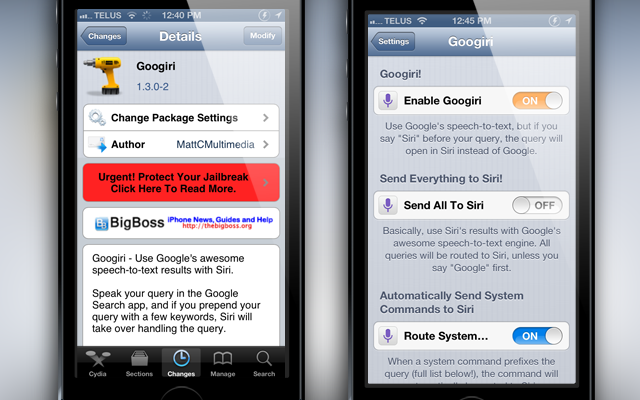 Any query that you prepend with Siri will result in Siri taking over Google Now in the processing of your command. When you say functions that can only be handled by Siri such as “remind me to do something in half an hour” the query will automatically be routed to Siri instead. And if for some reason you wanted to disable Google Now in completely and have all queries still be handled through the Google Search app, but be processed through Siri then there is a setting for that as well. If you are interested in the Googiri Cydia tweak you can find it in the BigBoss repo for free. Let us know what you think of the tweak in the comments section below. Note: You will need to download the Google Search app from the App Store in order for Googiri to work.